The Kunekune (pronounced "coonie coonie") is a small breed of domestic pig from New Zealand. Kunekunes are hairy, and have a dumpy build and can have wattles (or pire pire) hanging from their lower jaw. Colour ranges include black and white, ginger, white, gold, tan and brown. They have a placid, friendly nature and like the pot-bellied pig are now often kept as pets. Kunekunes were kept by the native Maori people, and kunekune means "chubby" in the Maori language. 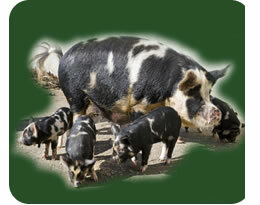 By the 1980s it was estimated that there were around 50 purebred Kunekune pigs left. After a successful breeding recovery program the breed is now in no danger, with breed societies in both New Zealand and the United Kingdom.